Ahmedabad- the city with peace around and yet having many companies growing up each day. But is starting up a company the only effort to take it to success? Khushboo Solanki has the answer. "Not only does the company need a right branding and marketing perspective but also a 360 degree branding perspective," she says. Effort to bring fresh, conventional approach with ideas, designs and implementation is what Khushboo creates. Khushboo, in 2005, completed her engineering from Nirma Institute in Information and Technology field and started off her career with strategy and consulting role at L&T Infotech in Mumbai- a city of her dreams, where she loved working for 5 years. "Life is unpredictable, she says while narrating about her journey in Ahmedabad. Rajiv Sharma, aged 34, her husband, an IIT graduate got an idea of opening India's first ever home grown fruit juice café "Joules". "We were well known by the people of Ahmedabad and hence thought of starting up Joules at Ahmedabad," shares Khushboo. She started working at a local offshoring IT Company as Manager Sales gathering all new work experience. She now had many challenges; her new job and her husband's new start-up which she definitely wanted to make a big success. 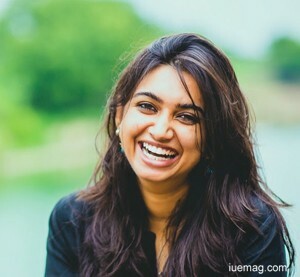 "I worked for Joules in part time helping with marketing and ideas as we didn't have huge budgets to start hiring professionals for," says Khushboo. After having worked for 2.5 years and juggling between two ventures, and having a kid as the priority, she prioritized her personal and professional balance and decided to work with projects where she could have a better control of time. She started consulting IT start-ups with their digital marketing and started working hard as sales and account consultant with start-up event and branding agency. There came a point when she realized that she needed to now stand on her own. "This company is named Zero Gravity Communications. The main aim of this company is to assist start-ups like Joules or small and medium sized companies with right branding and marketing perspective," says this young lady who brought about a revolution in the trend of start-ups. Here was the spark that brought about a change in the start-up companies. Soon, many start-up companies started to consult her to increase their marketing and help them know different ways to increase their markets. Now, 'Joules' has increased its chains and is working with full bang! They have four café chains in Ahmedabad itself. This young lady, not only started her own venture but also helped her husband's idea come to reality. All these were achieved while she never lost her hand over Aarya, her 3 year old daughter. "Apart from being the support system of my family, from a mother to an entrepreneur, I am avid reader with personal collection of more than 200 books. I can forget to shop clothes but not a book in a month. Writing is another passion of mine through which I talk about my ideas with this world," shares Kushboo. She blogs and also tweets about many things going around in her world. Singing and dancing have also been her forte since college times. At Nirma Institute, she won many awards for the same. She has completed Upanta Visharad in Kantya Sangeet. She is a social animal and loves to be with right set of people. She was awarded the Best Performance award - 2007 for work done at Larsen &Toubro Infotech, 'Vidhya Ratna Award' for being the best student. She was rewarded by Rashtrapati for participating in National Parade on 26th of January, 1998. She organized mock Lock Sabha under ISCT Students Chapter at Nirma Institute Of Technology.